Porsche model numbers originate from when Professor Ferdinand Porsche opened his design office in 1930. After 30 years of working for other firms, he was 55, and it was time to strike out on his own. Each design from Porsche was sequentially numbered, beginning with Typ 007. Family members were arrested in 1946 on suspicion of war crimes in WW II. Ferry Porsche, Prof. Ferdinand Porsche, and Anton Piech were imprisoned by the allies and questioned for complicity in Nazi war crimes. After they were freed without charges by the Americans, Professor Porsche and Anton Piech were arrested by the French and held in a dungeon for almost two years until a one million franc ransom was paid. 1947 was a tough time to begin a new company, but Ferry built one anyway as he struggled to save his father’s design firm. 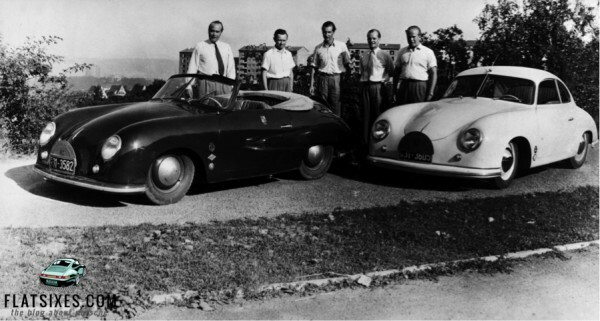 Neither the arrests, nor the lack of a factory, nor adequate financing prevented Ferry Porsche from acting on his vision of building a proper European car using the family name. It was Ferry’s way to honor his father’s lifetime work in the automotive industry, a career that began in 1900. The Porsche car was born in a dirt-floored sawmill. Lacking a factory did not stop the vision. Gmund, Austria was the family summer home, and some of Porsche’s plans and equipment had been stashed there to escape Allied bombing. Fifty aluminum-bodied coupes were built in a nearby sawmill from 1948-1951, genesis of a company that now produces over 140,000 cars per year. 1948: imagine a world-beater manufactured on a dirt-floored barn! Typ 356/1 was a mid-engine, tube-frame roadster. It set the stage for later developments in race and street cars that began with the 550 series, as well as continuing in the 914, the Boxster, the Cayman, and the Carrera GT. Typ 356/2 was a rear-engine, unibody coupe. It became the starting point for the subsequent 356 series and all versions of the 911. Porsche transitioned to Zuffenhausen as Ferry negotiated with Volkswagen in 1950. Porsche hired Reutter to build steel bodies for their cars and rented space at Reutter to build the frames and other parts. First-year production at their new home was 298 cars, and the 500th car was built on March 21, 1951. Typ 356s were truly hand-built. Even with mechanization and assembly line processes, all Porsche 356s were hand-assembled. Each engine and transaxle was built by one person, whose initials were stamped into the case. Craftsmen finished the bodies using traditional coach building techniques: body lead, wooden paddles, and body files. Check out Made By Hand, the Porsche factory documentary from 1960. Total 356 production was 76,000+ cars from 1948-1965. In a Road & Track interview from 1950, Ferry Porsche said that current factory production of six cars per day was sufficient because Porsche was “first and foremost a design and consulting engineering firm.” He did not foresee, at that time, that his “handmade special car” would revolutionize the automobile world and change the direction of Porsche. Forever. Thanks, Arnie. Glad you enjoyed it. 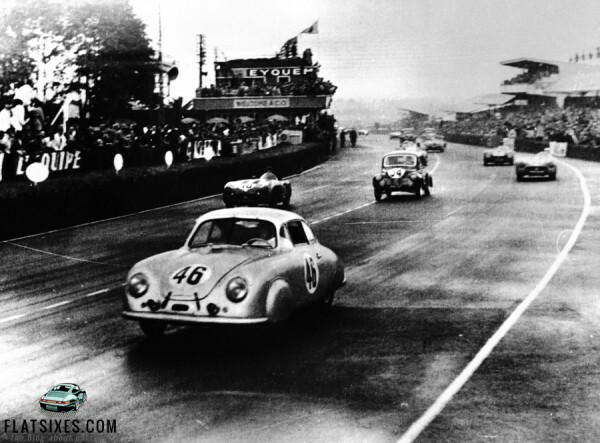 We’re learning a lot more about the 356 from Ron’s series. Can’t wait for the next 7 posts!